In the past week, I have had online conversations with a fellow blogger and others about the plethora of “charity walks” (or runs, depending on your energy level) in and around Kingston. This prompted my colleague to write a piece suggesting that this method of fund-raising was not necessarily the most effective in raising the profile of the organisation. In fact, he considered it a waste of time and effort for the private sector organisations concerned. I would have to agree that the “5K” model has become tired and overdone. But one thing is certain: They do have the potential, at least, to raise considerable sums of money. Go! This photo is from last year’s Sagicor Sigma 5K Corporate Run, the biggest in Jamaica. Its Sixteenth Annual run in February 2014 was its biggest ever, with 22,373 participants. The 5K run raised over J$21M for the Sickle Cell Unit TMRI at the University of the West Indies, the Sickle Cell Trust, The Special Care Nursery at the University Hospital of the West Indies, and Jamaica Kidney Kids Foundation. There must be a much stronger connection between the participants and the organisers. Many of those who join these walks, in their sun visors and short shorts and fashionable sports gear, seem mostly there to “profile” – to show off their gym-sculpted bodies and to get their photos in the newspaper or on a Facebook page. They take a lot of “selfies” and only stop taking photos and posting them on social media when their smartphone batteries run out. After an hour or two many will drop out and retire to the nearest watering-hole, dabbing at their gently sweating brows. How many of those who join these walks just do them to keep fit (which is of course fine)? How many tag along with friends, without contributing anything (which is not fine)? Chad Whyte with (from left) Lorna Clarke, Director of Corporate Communications, Urban Development Corporation, Antonica Gunter-Gayle, Director, Early Stimulation Plus and Jo-Anderson Figueroa, Monitoring and Evaluation Specialist, Digicel Foundation at the launch of the 5K Run/Walk for Special Needs. Mr. Whyte spoke on “Living My Life Like It’s Golden.” Beautiful title! Of course, there are exceptions. One of these is the Digicel Foundation’s Third Annual 5K Run/Walk for Special Needs, launched on August 13 at Digicel’s downtown Kingston headquarters. 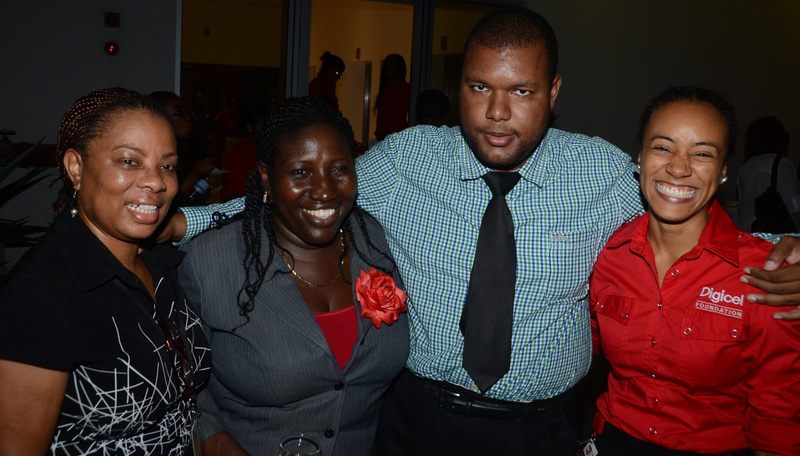 As with the previous two events, Digicel Foundation’s campaign is carefully thought out and well crafted. The focus of the event is clear. Chad Whyte, a student at Genesis Academy with Asperger’s Syndrome spoke eloquently at the launch, declaring: “It does not matter if anyone else accepts you as long as you are willing to accept yourself.” Of course, not everyone participating in the “Night Walk” on Saturday, October 11 will be fully engaged. But they will know what they are walking for, and they will also see the results of their feet pounding the sidewalks in the ensuing months. Now at one time, if you did a charity walk, you would collect signatures and pledges of money either for the whole walk, or so much per leg. It was often a tedious and frustrating process. You would be guaranteed to annoy friends and family with demands for commitment and then payment. This method is clearly too time-consuming and bothersome for our fast-moving, twenty-first century uptowners, so now participants simply pay a flat fee. They don’t have to raise any funds themselves, thus gaining supporters for the cause. They are less involved, and perhaps fund-raising options are curtailed. So these perambulations, it seems to me, have just become another way to have a little “lyme” out on the street. There is plenty of security, the sun shines, there is music, you “buck up” with friends you haven’t seen for a while. At times, there is a carnival atmosphere. It’s a pleasant way to spend a Saturday morning in Kingston. (Am I being a little unkind?) I do wonder, however, that if you did an informal survey and asked some random walkers/runners what they were walking or running for, they would not be able to tell you. 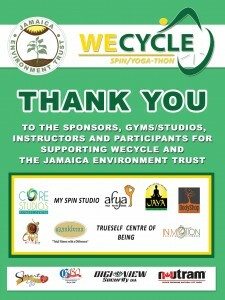 The “WeCycle” Spin/Yogathon was an effective fund-raiser for Jamaica Environment Trust earlier this year. Perhaps local businesses and charitable foundations could think of fresh, exciting new ways of raising funds, too. 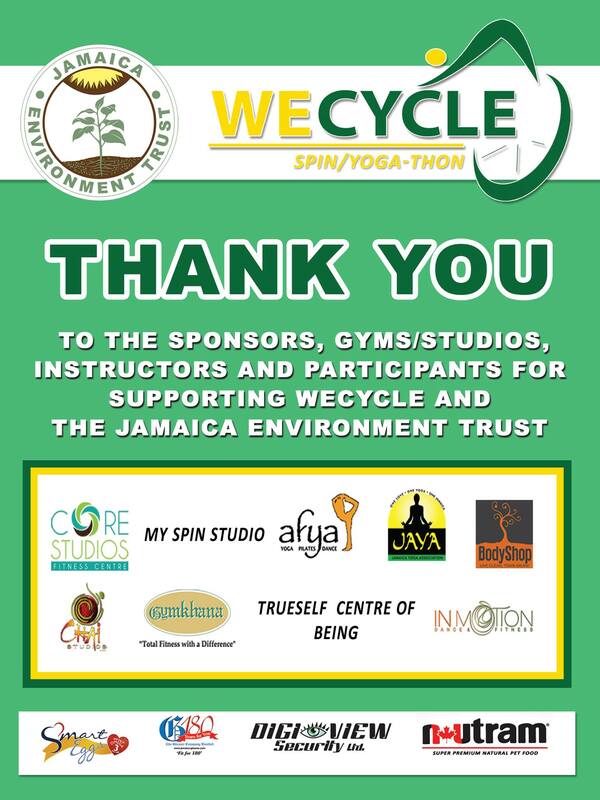 The Jamaica Environment Trust recently held a successful fund-raising effort by partnering with gyms (and my yoga studio) with an hourly rate for classes. Most of us who attend these places regularly were happy to join a class for a good cause. I am sure there are other fitness-related (or perhaps artistic or cultural participatory events) that could help to raise funds in an original and enjoyable way. Corporate marketers and fund-raisers, use your imaginations! We are not walking for purely social causes though, at all. It’s corporate Jamaica that organises the 5Ks, markets them in social media and donates the funds for a specific purpose. Would it be possible to stage a fund-raising walk in memory of Mario Deane, who was brutally beaten in a Montego Bay police lock-up and died later in hospital? Money could be raised in support of Mr. Deane’s grieving family – or perhaps to install CCTV equipment in the lock-up (which is not vastly expensive) or to improve conditions there. 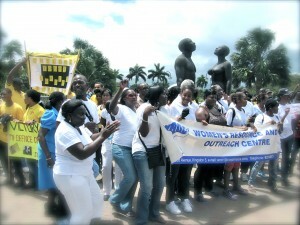 A part of the march for Jamaica’s Children rallying on May 1, 2012 for Child Month outside Emancipation Park. I recall one of the rare occasions when mostly middle-class, young uptown Jamaicans were galvanised into action for a cause. 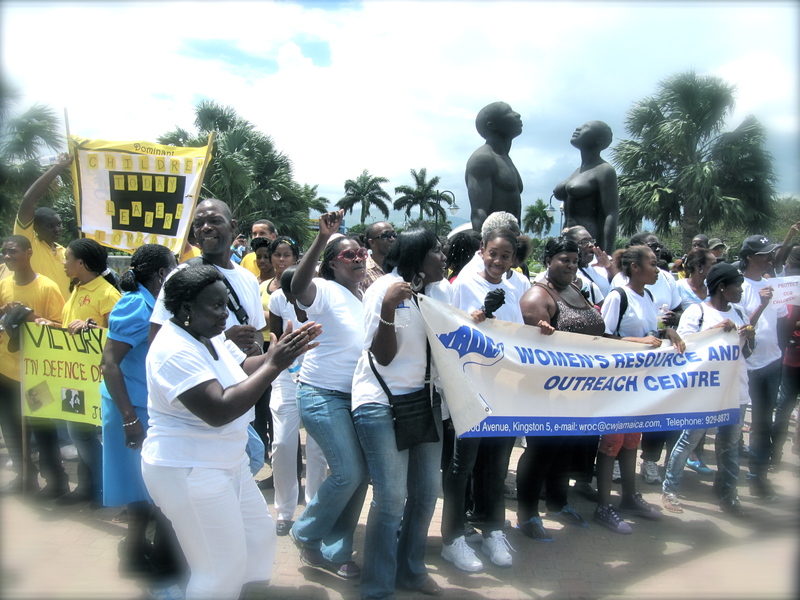 A group called Help JA Children, founded by Brandon Allwood, organised a march at the start of Child Month – May 1, 2012. This was amidst major concerns over the thousands of child sexual abuse cases reported annually to the Office of the Children’s Registry. We were also approaching the third anniversary of the deadly fire at the Armadale Juvenile Correctional Centre, when seven female wards of state died. We walked from the Bustamante Hospital for Children in Kingston to Emancipation Park, where we hoped to stop and hold up placards. However, we were not allowed inside the park; in fact, a security guard slammed the gate in our faces. After some negotiation, a few of us were eventually allowed in. We stood on the perimeter, holding up our signs for the occupants of the jogging trail and those attending some kind of religious rally to read. They all looked at us as if we were aliens. You would never think we were simply supporting Jamaican children. By the way, there’s a favorite spot, on the corner near the Laura Facey statue, for standing demonstrations. It is right on the busy road. Some drivers and their passengers will catch a glimpse of a message (often leaning out of their car windows with a comment or sounding their horn). And the guardians of the park need have nothing to do with the pesky protesters. Yes, it’s tame, but better than nothing. But the next time we walk for a cause, whether it be a hospital or a private sector charitable foundation, I would love us to give it more meaning. Let’s take the time to find out more about the cause we are walking for. Let’s make sure we contribute to that cause in some way, each one of us individually – financially or through volunteering. We can put a lot more heart into these walks, if we try. We can get really serious about building Jamaica by giving our time and energy, beyond a sociable hour or two walking the streets. Having said that…Those new trainers are really cool. Where did you get them? And how’s little Johnny doing at his new school? Very informative! As someone who does not jog or join these marathons, I also wondered how much and how money was raised by them. Your thoughtful comments are valuable. Thank you so much. Yes, there needs to be more transparency, too – and as I said, I would love for these fundraisers to be more “serious” and not just about fun and PR! Oh! Thank you for pointing this out. I was not aware of this aspect of running events. Perhaps the organizers need to do a “rethink” and make sure that it is a meaningful experience for all participants.